Start with the worksheet to recap adjectives and connectives, with the answers on slides 1-2 of the PowerPoint. This will prepare students for the pair/group speaking game using dice. 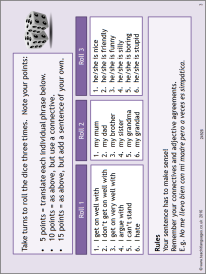 Slide 3 shows the elements to include for each roll of the dice and could also be used to generate written sentences.